This article by Andrew Syrios originally appeared on the Ludwig von Mises Institute website on March 31. More importantly, though, like just about every other discussion on inequality, they neglect to control for age. Age is by far the most important and most ignored variable in both income and wealth inequality. The word “age” doesn’t appear once in Norton and Ariely’s paper, nor does it in the Wikipedia page on the subject; and it is not controlled for in Edward N. Wolff’s influential paper on wealth inequality, on which this survey appears to be based. This feeds the illusion that the top 1 percent, or 10 percent, or whatever is a static group. But as the OECD noted, in 2008 there was an annual 27.2 percent turnover figure in who was in the top 1 percent of income earners. Further, a University of Michigan study showed that only 5 percent of the people in the bottom income quintile in 1975 were still there in 1991, and 29 percent had moved to the top. Wealth is a bit more stable than income, but it grows with time just the same. According to a Pew study, the net wealth of those over 65 between 1989 and 2009 went from $120,000 to $170,000. For those younger than 35, their wealth actually decreased from $11,500 to $3,500. Indeed, people under the age of 44 possess only 11 percent of the wealth in the United States. This is about the same as the distribution the survey participants desired, which should make it clear that they didn’t take age into account either. And this thought experiment assumes that everyone is equally talented, that every industry is equally profitable, and that everyone has just as good saving and investment habits. In addition, if we add just a small return on their savings, that chart would be skewed even more. There are many other factors that need to be considered when discussing wealth inequality as well. For example, while the entitlement systems in the United States are embarrassingly underwater, they should be considered. According to Bankrate.com, “A male average earner who retired at age 65 in 2010 paid out $345,000 in total Social Security and Medicare taxes, but will receive $417,000 in total lifetime benefits ($464,000 for a woman).” If the government simply mandated people to have a health savings or retirement account (or better yet, let people keep their own money), that would smooth out the curve. Since payroll taxes are capped at $113,000, most of the increase would go to the lower and middle classes. Furthermore, Norton and Ariely’s study compares households instead of individuals — a tried and true way of distorting income and wealth data. Households vary in shape and size and cannot be directly compared. As Thomas Sowell has said, “… there are 39 million people in the bottom 20 percent of households, and 64 million in the top 20 percent. So you’re saying, yes, 24 million additional people do tend to have more money.” When we further take into account that many in the bottom 20 percent are recent immigrants from poor countries, in prison, single parents, on welfare, disabled, drug addicts, etc., it becomes clear that dividing the country into such groups is simplistic at best. 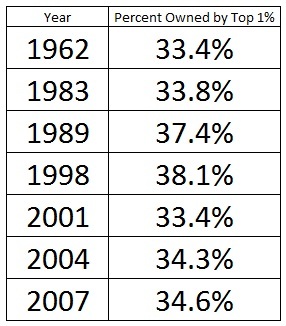 So wealth inequality is not nearly as out of control as many liberal pundits say. This, of course, does not mean everything is fine and dandy. Cronyism and government largesse have caused serious problems throughout the economy and should be done away with, not compounded with more redistribution and government control. Andrew Syrios is a Kansas City-based real estate investor and partner with Stewardship Properties. He also blogs at Swifteconomics.com. See Andrew Syrios’s article archives. This entry was posted on April 2, 2014 at 9:31 pm and is filed under America, Canada, Economics, politics, Progressive, propaganda, psychology, sociology, Uncategorized. You can follow any responses to this entry through the RSS 2.0 feed. You can leave a response, or trackback from your own site.